Whether you’re in the market for a new air conditioner, or you want to better understand your current system, it’s helpful to learn the basics of how an air conditioner works. In this article we’ll teach you about your air conditioner’s six major components, as well as some facts about SEER and recent efficiency improvements. The following information is relevant to air conditioning in the Fort Myers, Cape Coral, Lehigh Acres, Sanibel, Fort Myers Beach, Estero, Bonita Springs, Naples, Punta Gorda and Port Charlotte areas of Southwest Florida. Residential air conditioning and heat pump systems have substantially changed in the past 15 years. Back then, efficiency was not considered a high priority as electricity rates and cooling costs were low. An air conditioner with a 10 SEER (Seasonal Energy Efficiency Ratio) rating was considered high efficiency at the time. Seasonal Energy Efficiency Ratio (SEER) measures air conditioning and heat pump cooling efficiency. SEER is calculated by dividing the cooling output by the electric consumption. A higher SEER equates to lower electric consumption. 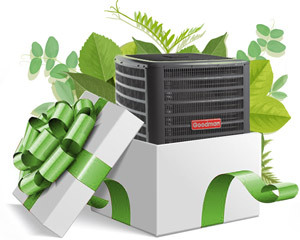 Today’s residential central air conditioners have efficiency ratings up to 20 SEER and beyond. 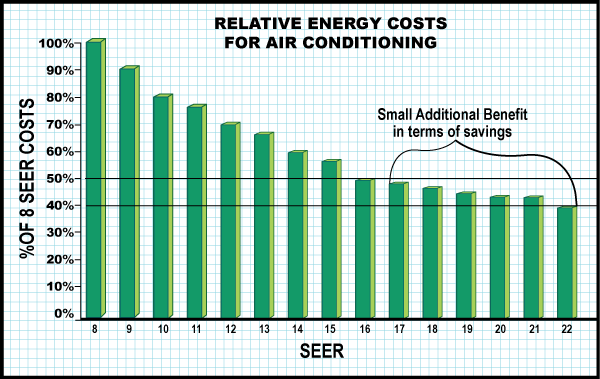 This graph shows cooling cost for different SEER rated units. Federal government regulations require manufacturers to produce higher efficiency units. Today, the minimum SEER rating for a new residential air conditioning system is 14 SEER. However, a 16 SEER system is considered the “sweet spot” for energy savings relative to the initial cost of investment. As you can see on the graph above, a 16 SEER air conditioner will provide the same amount of cooling as an 8 SEER unit for half the electricity cost. Higher SEER systems offer additional benefits above and beyond strictly energy savings. Some of these benefits include enhanced humidity control, improved indoor air quality and the ability to maintain a consistent temperature in your home. Many people in our area refer to central air conditioning systems as heat pumps. While this is technically correct, most central air conditioning systems in Southwest Florida do not use heat pump technology to heat their homes. We’ll talk more about this later in the article. Air conditioning manufacturers were forced to redesign their central air conditioner units in order to achieve higher efficiency levels. One way they increased efficiency was to increase the size of the air handlers and condensers. This maximized the surface area of the refrigerant coils, which absorb the heat in the house and transfer it to the condenser coil outside. Older air conditioners used a refrigerant gas known as R22. Recent federal regulations phased out R22 refrigerant gas as it is partially responsible for depleting the ozone layer and thus contributing to global warming. In the past, when replacing an air conditioner, the installers would cut the refrigerant lines and “gas off” the R22 into the atmosphere. Today, we’re required to evacuate the systems to reclaim the refrigerant gas and not release it into the atmosphere. All new residential central air conditioners are required to use the eco-friendly refrigerant R410A which doesn’t have the effect on the ozone as R-22. The thermostat is your central air conditioner’s brain. It senses the temperature in your home and sends a signal to the system to turn on when the temperature reaches the set-point. Older thermostats allow the temperature to rise as much as four degrees between on and off cycles. Today we have thermostats that narrow the temperature swings between on and off, reducing the difference to as little as one degree. Some residents in Southwest Florida install humidistats to control humidity. While allowing the temperature in their home to increase, they hope to maintain a humidity level that keeps mold and mildew from growing. Humidistats are widely misunderstood and misused. To maintain a certain humidity level in the Port Charlotte, Punta Gorda, Cape Coral, Fort Myers including Sanibel and Fort Myers Beach, Lehigh Acres, Estero, Bonita Springs and Naples areas, where we experience high humidity, a humidistat can run the temperature down below the set-point to satisfy the humidity level setting. This is known as a “droop” and can make your home uncomfortably cool. Today we have thermostats with built in humidity control. These smart thermostats also have WIFI capabilities so you can monitor your home’s temperature from anywhere in the world – as long as you have internet connection. If the thermostat is the brain of a central air conditioner, the condenser is the heart. 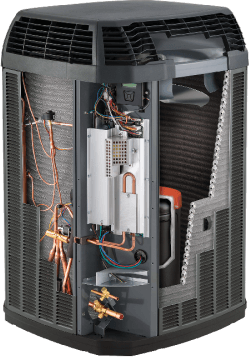 The condenser is the outdoor unit that houses the compressor and condenser coil. The compressor’s job is to super-heat the refrigerant gas that absorbed the heat in your home and to dissipate the heat to the outside atmosphere. The cooled gas is now a liquid that is pumped back to the house to absorb more heat. In our human body analogy, the air handler is akin to the lungs. The air handler is probably located inside your home, but it could be in your attic or garage. Its primary function is to remove the heat and humidity from your home and replace it with cool, conditioned air. After the condenser cools the refrigerant gas to a liquid, the liquid is pumped back into the air handler. There, a fan draws pulls warm air from within the home across an evaporator coil which absorbs the heat. As the liquid refrigerant absorbs the heat from the house, it converts to a hot gas. The hot refrigerant gas is pumped to the outside condenser. 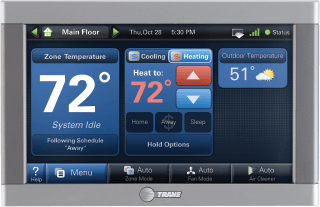 This process is repeated until the home is cooled to the thermostat’s set temperature. 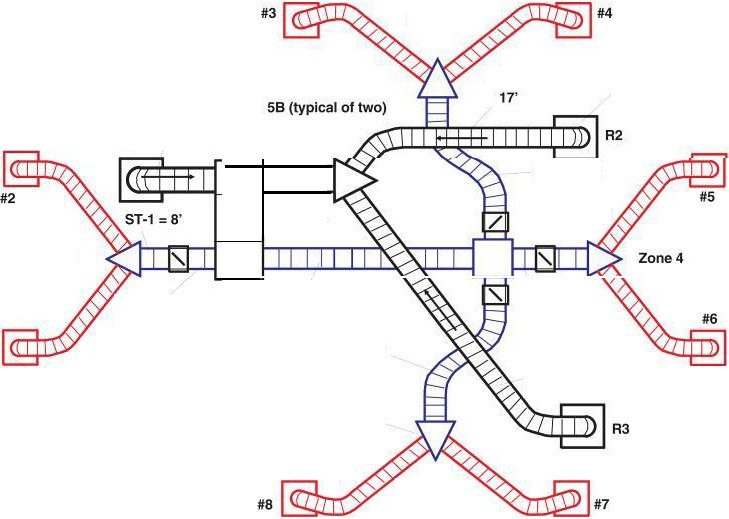 The ductwork is the air conditioner’s circulatory system. The air handler’s fan motor draws hot air through return grills, which are typically located in your home’s ceiling where the warmest air resides. The hot air travels through the return duct, connected by flexible ductwork, into the air handler and across the evaporator coil where it is delivered to the condenser for cooling. This process also removes humidity as moisture from the warm air forms condensation on the evaporator coil. This moisture is drained outside. The cooled air is pushed through the supply ductwork back to supply grills and into the conditioned space. Filtration is the kidneys of a residential central air conditioner system. A filter is installed either in the return register or just before the entrance to the air handler. 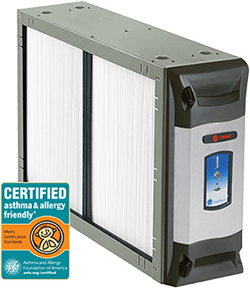 The filter’s purpose is to capture dust, dander, or other particulate matter and keep it from recirculating in your home. Older style air filters do little more than collect large particles of dust. These filters can be cumbersome to change if you have multiple returns and high ceilings. The FL Green Team recommends you change the filters located at your return grills four times a year. Over the past several years new home construction efficiency standards require builders to build homes that are a lot tighter and allow less fresh outside air into your home. This has the potential to create indoor air quality issues as you are circulating the same air in your home over and over. Fortunately, there are several newer high flow pleated air filters that filter 100 times better. These new air filters can be installed at your air handler and only require changing once a year. Many people from the north refer to central air conditioners as heat pumps. As the name suggests, heat pumps move heat from one place to another. Basically, a heat pump is an air conditioner running backwards. An air conditioner absorbs the heat in your home and transfers that heat outdoors using a refrigeration cycle. A heat pump reverses that cycle. It absorbs heat from the outside air and transfers this heat into your home. In order to grasp this concept you have to realize that even in air that seems cold, heat energy is present. When it’s cold outside, heat pumps are able to extract outside heat and transfer it inside. When it’s warm outside, they reverse this process to push unwanted heat outside. In Fort Myers, Cape Coral, Lehigh Acres, Sanibel, Fort Myers Beach, Naples, Estero, Bonita Springs, Port Charlotte and Punta Gorda heating costs represent less than 5% of your heating and cooling costs. In these areas, most homeowners install what are known as “electric strip heaters” or “electric resistance heaters”. Imagine a giant toaster in your air handler, and you’ll have a pretty good idea about how electric strip heaters work. When you need to heat your home, the electric strip heater comes on to generate heat. This is a highly inefficient heating method compared to a heat pump, but considering how rarely we heat homes in Southwest Florida, the additional cost of a heat pump in most cases isn’t worth it. This is not to say we don’t install heat pumps, especially in Charlotte County. In central Florida and Northern Florida heat pumps are used more frequently where winter temperatures are much lower. The FL Green Team has knowledgeable Comfort Specialist service technicians that will provide a FREE and honest analysis of the health of your air conditioning system. The FL Green Team prides itself on integrity and we vow to treat with you with respect – no high-pressure sales tactics, just professional service by expert technicians. We will provide an honest assessment of your system and a number of options tailored to your particular air conditioning needs. Call us today to schedule your free assessment – 239.432.1500. You can also get an estimated price for a new air conditioner online with our free AC Estimate Calculator.